My oldest child came home from school with a permission slip for his first ever field trip. "I don't want to go," he says, "because you're supposed to get on a bus without a parent. I want to go if you take me." The weight of this field trip with it's taunting permission slip that sits on my table unfilled out (as there's no way I'm putting my Kindergartener on a bus and sending him off on a field trip without me) -- well, it's crushing. I stop thinking about it just long enough to watch my 18-month old pull a stack of paper onto the floor, following it up with an avalanche of crayons that never made their way back into the container in which they were supposed to be put back into yesterday. My youngest is more independent than my oldest ever was, even now at eighteen months when she'd rather eat ice-cream with her fingers than ask me for help with the spoon that keeps getting stuck in the thick, white scoops of vanilla Ben & Jerry's. My oldest remains more attached still, just slightly seeking out enough independence to give me anxiety in that "what do you MEAN you don't need me to walk you all the way into your classroom?" kind of way. My oldest would sit and paint for hours, even as a toddler, but my youngest will humor me with a fifteen second crayon drawing before moving on to color the floor or walls or whatever is closest by. I'd say they're a perfect balance but maybe only if you replace the word balance with chaos and throw in a lot of love and laughter and high-pitched shrieking because that's apparently my toddler's favorite tone to speak in lately. Still, the bassinet that I carefully picked out when my Kindergartner was an embryo inside my uterus sits in the garage. I've humored my husband that I'm going to sell it, listing it for way more than it's worth and acting surprised when no one bites. We could use the space in the garage, of course, and I'm sure there are new parents out there who could use a bassinet but I cannot part with it. For most other mothers, this often means "we don't know if we're finished having babies yet." It's probably the hottest topic of playground conversation: how to know if you're done having kids while surveying other moms to figure out who still has reproduction on the table. The thing is this: we're done having babies. We're done having babies because life told me I had no choice but to be done having babies, whether from my womb or someone else's. The extra room I always said we would have a closet built into to turn it into a bedroom will forever remain some mixture of a playroom, Lego workshop and Room To Keep Clutter. We'll never get to pluck any of the baby names we've stuffed up into our brains and see them in print on another birth certificate. We'll never get to decide who gets to make the bottle and feed the baby at 2 a.m. and soon, before we know it, I'm sure, we will never buy another box of diapers. I've been thinking about this a lot: the lasts. When did it become the norm for my oldest to walk alongside the grocery store cart and not ask to ride? When was the last time he sat in the cart, balloon in one hand and cookie in the other? When was the last time he wore a diaper, even? The lasts all blend together underneath the mess of the chaotic days and eventually you adjust to the sleep deprivation and you just sort of accept the new normals as they come. I'm there now, facing my issues of permission slips and field trips and open houses while juggling a toddler's dance classes and gym classes and no-longer-monthly well-visits. Never will I ever bottle feed a baby again, or have that moment where I get to see my baby for the first time and think this is it, here you are. Never will I ever get to sit through another mommy and me class with infants sprawled across blankets as tired new moms discuss milestones and how much (or how little) sleep they got the night before. That phase of my life is over, even if by no choice of my own, and as much as this phase of life is beautiful and wonderful and perfect, I will always be able to feel the ache. I will forever miss the normalcy that was robbed from me when my baby wouldn't make it. I will miss the children we never got to have, the ones I had in mind when I insisted upon bench seating for our larger than life dining room table when we were just twenty-one years old. And, I know, one day I will look back and miss -- with the same dreadful ache -- the Kindergarten years, the toddler years, the high-pitched dance parties to DMX and Andrew McMahon in my living room while dinner burns in the oven. I will miss permission slips and field trips being my biggest worries. I will miss having to clean crayon off of the walls and the floor and the mirror and the side of my car (I'm still not sure how that happened). The ache will be there, buried underneath the memories from this phase of life, too. I put a lot of stock into being present in the moment but I'm realizing each day just how very valuable memories themselves are. Onward. With the unbelievable joy, the laughter, the chaos and the aches that become a part of you -- onward. Because that is the greatest gift life can give you. 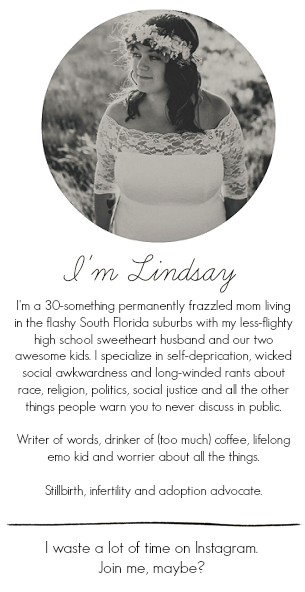 Hi Lindsay, I got your blog as a random one to read. My children are 26 and 18. My son still lives at home, he is the eldest and my daughter lives with her grandmother but I still help her with the "adult" stuff. I often wish that I could go back if even for a day and enjoy them as infants or young children. It seems unreal to me when I hug this big man who used to be my baby or look at my 18 year old daughter and remember her being young. It is bittersweet. The link has the toll free number from which user can contact our customer support team and can solve theri problem.